Who will campaign door-to-door for America? Carry the flag shore to shore, for America? Sometimes, life imitates art—and in our social media age, that means celebrities on Twitter becoming increasingly like the characters we know and love them for playing. Few emulate that ideal more than Chris Evans, who wields his Captain America might online to...well, dunk on idiot U.S. politicians. Evans’ outspoken distaste for the Trump administration has been a thing for a while, and it’s at times disarmingly refreshing to see it unfold on Twitter as he basically becomes a real-world Steve Rogers. It’s disarming because, after all, Evans is one of the faces of one of the biggest movie franchises on Earth, one owned by the Walt Disney Company, which...well, let’s just say has a fraught relationship with trying to advocate that its inherently-politically-tinged blockbuster franchises like Star Wars and the Marvel movies have no politics in them at all, and are for everyone regardless of where they sit on the ideological spectrum. Because a consumer’s dollar is still a dollar to Mickey Mouse. 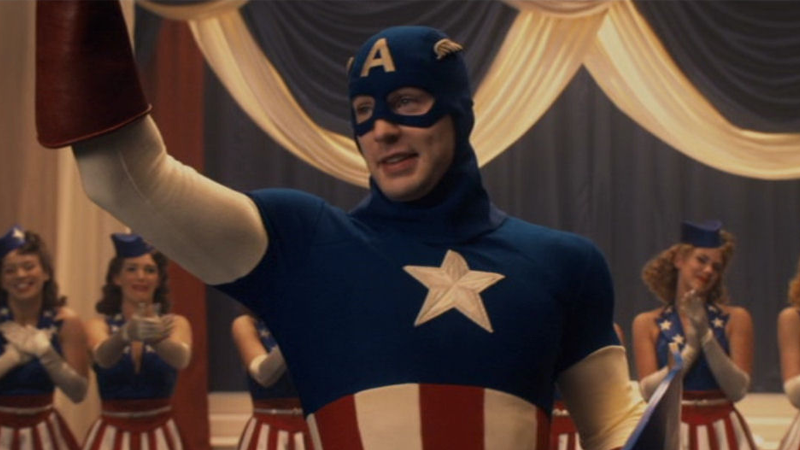 So you’d think the idea of Chris Evans spouting off against whatever latest cruel nonsense comes out of Donald Trump’s mouth would have the House of Mouse—the same one that tried very poorly to say “We don’t think this space movie about a group of diverse insurgents rising up to fight an empire of space fascists directly inspired by the aesthetic of the Nazis has any politics in it all, actually” a few years ago—very eager for the actor to not do that. It’s fascinating because, like I said, Disney and its acquisitions are usually fairly reticent in admitting that even their most blatantly political stories have any politics in them. I mean, if they’re willing to go to bat for an allegedly-non-political Star Wars, who’s to say they wouldn’t try the same with a character who literally dresses up in the colors of the American flag, slaps an A on his headgear, and whacks fascist bad guys with a stars-and-stripes-themed shield for a living? One who is in part defined by the political angles of his stories in the comics, for better or worse? But it’s also fascinating in contrast with Marvel’s other side—its comics division, under the eyes of Marvel Entertainment’s chairman, and noted supporter of the Trump administration, Ike Perlmutter. Just last year, that same comics division canceled a Darth Vader Star Wars series to be penned by author Chuck Wending, allegedly in part because Wendig was too vocal—too “vulgar”, specifically—about his own outspoken views of the Trump administration on Twitter. Feige famously wrestled control of Marvel Studios out from under Perlmutter’s auspices a few years ago to instead have it report directly to Disney, rumored in part due to Perlmutter’s infamous frugality. It seems it’s a move that’s had other benefits for Feige and the casts of his movies, but something that doesn’t necessarily apply to the creatives behind the comics they’re inspired by. Stalwart and steady and true, Forceful and ready to defend the Red, White, and Blue!